The following anti-hack trading systems are implemented to protect your valuable items and eudemons from being hacked. Now you will feel safe and enjoy a fair trade with your business partners. May your super items and eudemons bring you great fun. a. 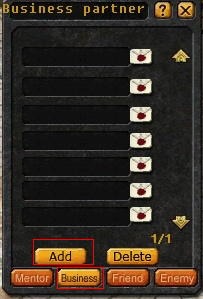 If you are below level 70, you cannot trade to obtain a star-20+ eudemon or the equipment of 30 levels higher than you. If you need these items very much, you may obtain them by trading with your business partners. b. You are not allowed to drop an item worth 1000+ EPs or a star-20+ eudemon. If an item is traded at a very unreasonable price, it will be marked as a stolen item. This mark will last for 3 days. During this period, the system will warn you to be careful when you trade such items. 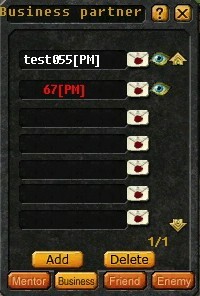 By the way, the auto-retrieve system will be implemented soon. Once this system is released, you will be able to retrieve your hacked items by yourself. 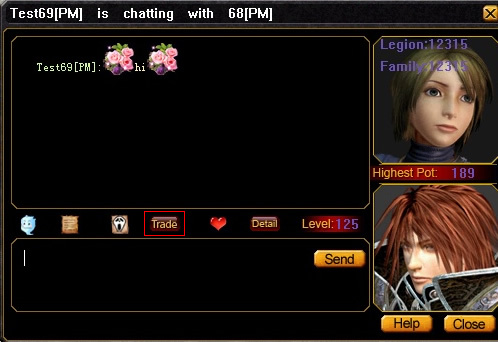 To avoid trading with the wrong target, you can make a trade with your whispering target by clicking the “Trade” button on the Whisper Window. In order to enjoy a fair and safe trade, you can establish a long-term business partnership with the trustful people. How can I make a business partner? You can choose one of the two ways to make a partner. 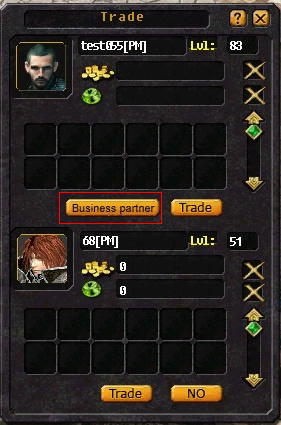 1) Click Business on the Partner window. c. Click on the target player to send your request. d. Once the target accepts your request, you will become trial partners. a. Click on the scale icon, then the target player to open the trade window. How long will the trial period be? 3 days. After this, you will become official partners. What can I benefit from the partnership? You can enjoy a fair and safe trade with your trustful partners, and there will be no restrictions for trading between the partners.